Ogunbowale signed a futures contract with the Buccaneers on Monday, Greg Auman of The Athletic reports. Analysis: Ogunbowale appeared in two games for the Buccaneers this season, with all but two of his snaps coming on special teams. He'll look to make the roster as a backup running back in 2019. Ogunbowale signed with the Buccaneers' practice squad Tuesday, Jenna Laine of ESPN.com reports. Analysis: The reserve running back and kick returner makes a quick return to Tampa, landing back on the practice squad after having just been released last Friday. Ogunbowale was active in Weeks 11 and 12 against the Giants and 49ers, logging just two snaps from scrimmage but 35 on special teams. The 24-year-old amassed 134 kick return yards versus New York, and he'd likely be used in the same capacity were he to be called up to the active roster again at any point over the final four games. Ogunbowale was waived by Tampa Bay on Friday, Greg Auman of The Athletic reports. Analysis: Ogunbowale had worked mostly on special teams for the Buccaneers. The Wisconsin product was waived to make room for wide receiver Bobo Wilson, who helps provide depth in the wake of DeSean Jackson's (thumb) absence. In addition, the Buccaneers once again have fellow running back Ronald Jones at full health, further negating the need for Ogunbowale's presence on the roster. Ogunbowale returned seven kickoffs for 137 yards in the Buccaneers' 38-35 loss to the Giants on Sunday. Analysis: The 24-year-old rookie was promoted earlier in the week from the practice squad in the wake of Shaun Wilson's placement on injured reserve with a shoulder injury, and he did a solid job filling the latter's role on kickoff returns. Ogunbowale could potentially continue serving in the same capacity for what remains of the season, although he could also find himself inactive if Jacquizz Rodgers is tabbed to fill the role once Ronald Jones II (hamstring) returns to action. Tampa Bay promoted Ogunbowale to the active roster Tuesday. 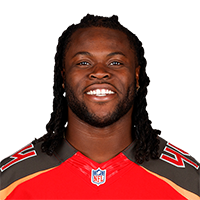 Analysis: Ogunbowale spent the preseason with the Buccaneers, rushing 21 times for 55 yards and catching six passes for 69 yards. He also returned kicks, and Tampa Bay could utilize him in a similar way now that he's back on the roster. There are no videos available for Dare Ogunbowale. Click here to view all videos.